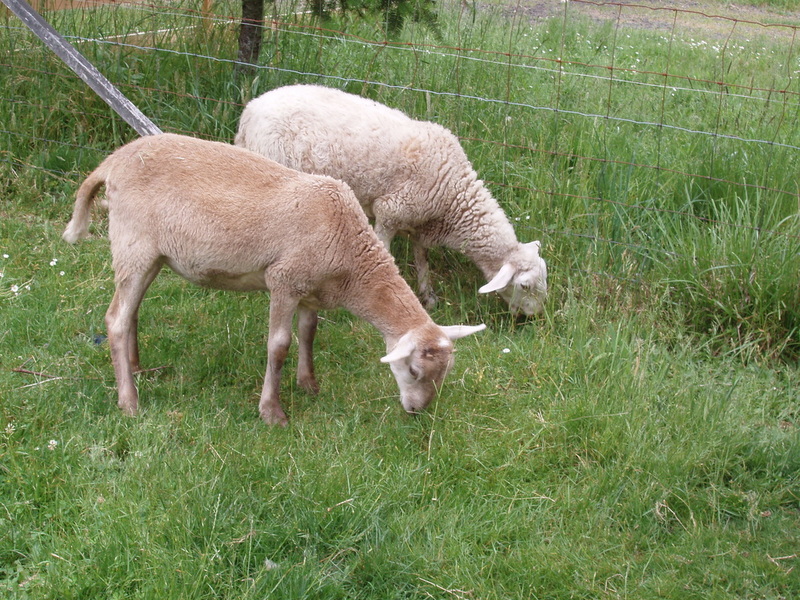 This is Flopsy and Fawn as lambs. KRK stock. We have some registered katahdins and recorded. The Katahdin is a hair sheep breed that originated here in the US. During the late 50's the Piel farm in Maine began cross breeding with hair sheep from Africa that they imported from St. Croix, Virgin Islands. 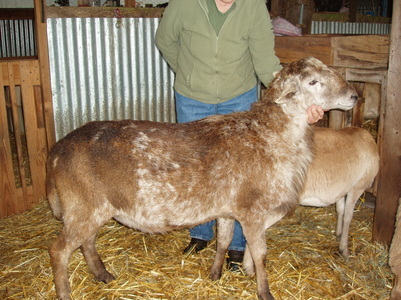 The goal being to produce a meat sheep that did not require shearing. They also do not need tail docking. We have found this breed to be very docile and easy to handle. They are very friendly, calm and we find them to be very dedicated mothers, being very protective of their babies. They are reported to have a long productive life and our first time mothers have all had twins with no trouble. Triplets are not uncommon. I have been told that they will breed all year, so a well-managed and selected flock can produce a 200% lamb crop. We only breed our girls in the fall for a spring lambing, as a personal preference. The hair coat seems to vary in length and texture and can be any color or combination of colors. During the winter they get a heavy undercoat that will shed out in the spring. They like to rub on anything available and being that ours our very spoiled I find they love to be brushed out. In the picture above the coat difference shows in these girls. One is quite a bit longer and fluffier. Their meat is naturally lean with a very mild flavor. Their are several farms that use them for milking - making of sheep cheese. Being with hair instead of long fleece makes them a good sheep for this purpose and their mild disposition makes for easy handling. We find these sheep to be easy care - maintain good health with just a good quality hay we give them in winter and unlike some of the wool breeds we find them more goat like in some of their habits. They will strip the bark from young trees and stand up their hind legs to get at the limbs. Our animals are given orchard grass - grain only on occasions. After lambing I will give them a little for a few days or top dress their hay with alfalfa. 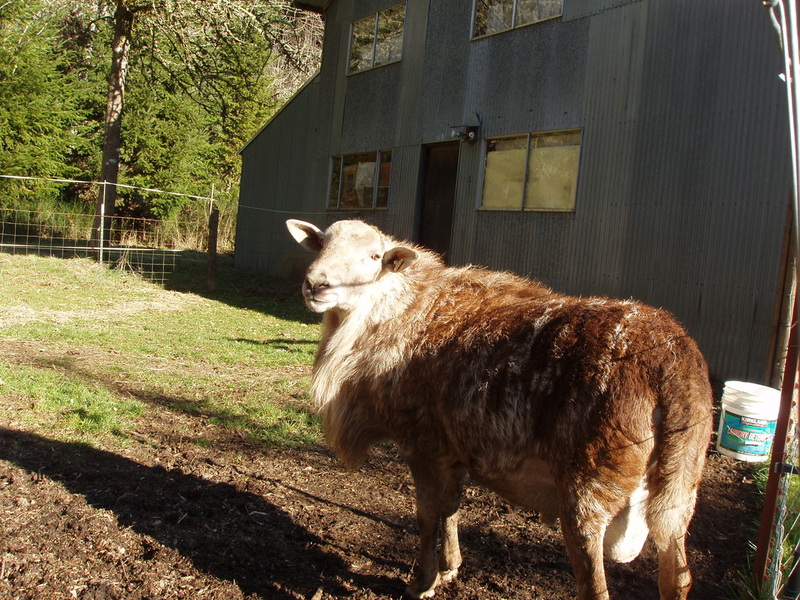 Our ram is a lovely mellow guy and from my experience so far I think that is the norm for this breed. He is throwing some beautiful lambs for us with lots of color showing up. He is a registered Katahdin from KRK stock. He is shown below at 18 months of age. 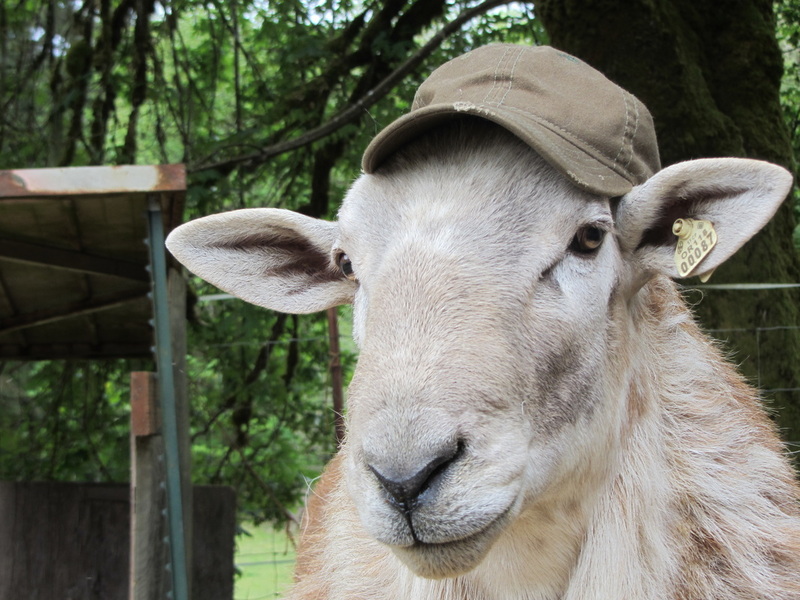 All our sheep have tested negative in 2014 for CL and OPP. ​We find the katahdin meat to be very good - more beef like and not a strong lamb taste. Rambo - our favorite guy. Our ram is from KRK Katahdins. This is Rambo this year - bigger and more muscular but still the quiet and easy to handle guy. He has grown quite the mane. He is my husband's baby - comes and lays his head against Tom wanting to be pet and given treats. He would give his life for an apple. From I5 - take Cresswell, or Cottage Grove turn off and go to Territorial Hwy -turn left to Lorane. At Lorane the road forks, the right fork is Siuslaw Rd. (well marked) We are 4 and a half miles on your left. Google "Winding River Farm" for complete directions. Rambo loves to wear the hat. Seems to strut when Tom puts it on him. He is the most mellow ram I have ever encountered. Will come when ever Tom calls him.